Girls. Teen girls. Preteen girls. Here they are in their natural state. No one giving a mandatory peace sign while they stick their tongue out a la Miley Cyrus. 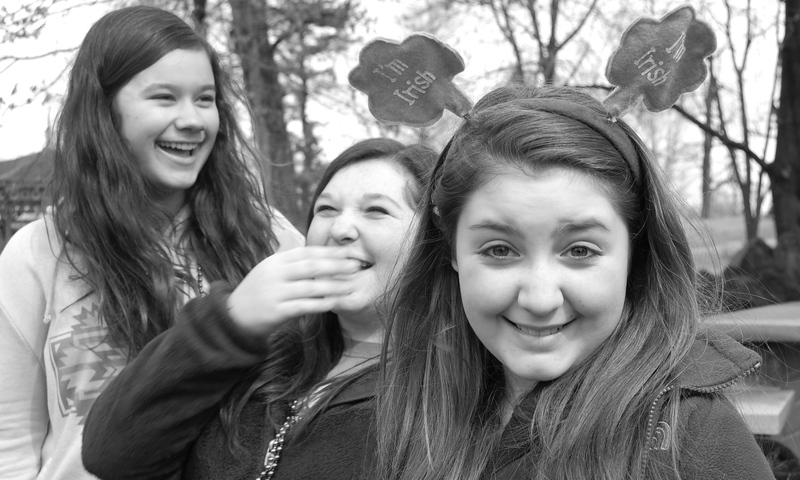 This was taken at a local St. Patrick’s Day parade this year – I had taken 100 pictures of the three of them. Each one identical (see note above re: peace sign). This was 101. Snuck in. A surprise. It’s my favorite. As mothers we know what’s coming. Relationships, break-ups, college, jobs, and if they choose…love-marriage-kids. But for now, for today. I like to see them like this. Giggling, silly, happy, wearing appropriate holiday attire and not trying to grow up too fast. Previous Is a fair weather fan better than no fan at all? Next Freak like me? Your kids have NO idea how lucky they are to have you and your hubby as parents.For me it is especially heart warming to see how you value and enjoy the most important things in life,family! Keep up the great writing it brings smiles to my face. You can’t imagine how much fun I’m having – thanks again for the kind words! Ha! Loving the “candid” shot, how happy and full of life! We have the best girls around, don’t we???!!! Loving the “candid” shot, can’t believe you got one without the typical pose! How beautiful they are and how great they are too!!!!!!! Beautifully said! Mine is 12 and between the school drama, boy/ girl drama, and homework, I love when I catch her still bing a kid! GREAT post! ha! Glad it caught your attention!